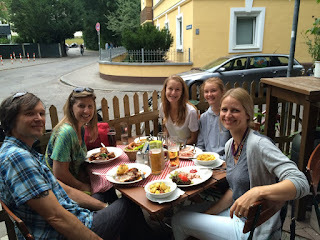 Last month my family and I traveled to Germany for vacation and had a wonderful time. With so much history to see and things to experience, there was no shortage of activities to keep us busy. We started in a city where we had never been, Berlin. With a population of 3.5 million people, Berlin has an incredible number of activities to choose from which made it difficult because we only had a few days. We took a hop on/hop off bus tour around the city which was challenging for me but nevertheless pretty fun. When we realized that buses were basically staying in the same general area, we just decided to walk around the city and had fun checking out the city. We saw many sites around the city including Brandenburg Gate, the Memorial to Murdered Jews of Europe, the Topography of Terror and much more. One day we took the train and bus across the city to Waldhochseilgarten Jungfernheide. This place consists of a ropes course high in the forest that you climb and traverse while wearing climbing gear so that there's no chance of falling. Janene and the girls really enjoyed this adventure while I took many photos from the ground beneath them. Although it was very hot and we stayed in a hotel with no air conditioning, we still had a wonderful time relaxing and letting our curiosity drive us to sites and cafes all around the city. After Berlin, we took a train to the city of Halle about 1.5 hours south. Halle is where our au pair from about 10 years ago named Henriette and her husband Franz were both born and raised. We were lucky enough to spend some time with them and their little boy Gustav and also attend their wedding where we met many of their friends. We had such a good time and were so happy to see their wedding in-person rather than only view the photos after the fact. We also visited many historic places in Halle. Of course, no visit to Halle is complete without a visit to the oldest chocolate factory in Germany, the Halloren Chocolate Factory. Not only does it have amazing chocolates but it also has an interesting and varied history. We even ate döner kebab for the first time and even though we are not big meat eaters it was pretty delicious! We were also able to visit a friend of Henriette's named Franzeska, her husband Daniel and their little boy Johann. Franzeska was an au pair for some close friends of ours while Henriette was with us and so we got to know her during that time as well. After several days in Halle, we took a train about five hours south to Munich. After a long train ride we arrived in Munich, a city with which I am somewhat familiar being that my company is located there. Munich is such a different city compared to Berlin and we were told by many people that this is due to the differences between the old Eastern vs. Western Germany. Just as in Berlin, Munich is full of things to see and do. 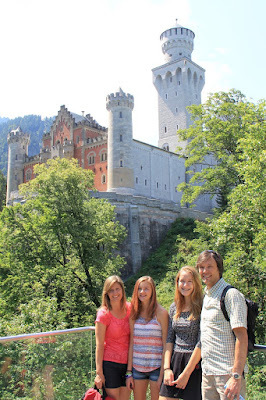 One day, we took a bus tour south of Munich to see Neuschwanstein Castle -- and Linderhof Castle, both of which were incredibly opulent and somewhat amazing for the time in which they were built. We did a tremendous amount of walking on this day around the castles. Despite my leg braces and using both arm crutches the whole time, I kept up with the tours pretty well. 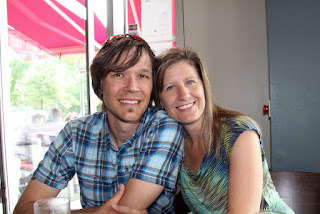 We also spent time in Munich just hanging around the city to see the sites. This also involved a lot of walking but I actually didn't mind it. I took breaks when I needed to and enjoyed the sites. One night we took the train across the city to the Osterwald bier garten in a different area of Munich to meet a friend for dinner. It was wonderful to see her and visit for the evening. There is nothing like a true vacation where you unplug completely, forget about all of your responsibilities and don't worry about anything. This was one of those vacations. After my spinal cord injury, it was really difficult for me to enjoy very much for a long time because I was so uncomfortable all the time. Taking this vacation was a true test for me both physically and mentally. I am happy to say that I did not feel left out, though I was jealous that my family got to spend one afternoon taking a bike tour around Munich. Still, this made me think that I can do many things that was not sure would be possible. Yet again, I feel so lucky to have the love and support of my family who have always stuck by me.